Celebrate Black History Month in St. Augustine. Celebrate Black History Month on St. Augustine during the month of February 2015 with the Flight to Freedom event at Fort Mose State Park, the Welcome to St. Augustine program at Castillo de St. Marcos Fort, Black History Month Program at Castillo de San Marcos, and a wide variety of St. Augustine Black Heritage Tours throughout the month. Give your beloved a wedding proposal she’ll cherish for a lifetime. St. Augustine. Valentine’s Day. What better place to do it? Get help with your marriage proposal and once your bride says yes, start off the wedding planning journey with engagement photos and save-the-date invitations. Celebrate Valentine’s Day in St. Augustine, where wonderful Valentine’s Day date ideas and gift options abound. 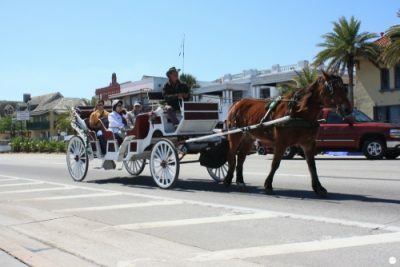 From romantic carriage ride tasting tours, a Valentine’s Day meal at the Floridian, or a chocolate and wine tasting tour from City Walks to a cocktail class at the St. Augustine Distillery, a dreamy Valentine’s Day sail on the Schooner Freedom, and, of course, lovely overnight stays at one of St. Augustine’s many Bed and Breakfasts and romantic hotel suites, the romantic possibilities are endless.